In the Episode 7 of ASEMBLE, Myself, Codename and Zbot talk about a lot of Half Life 2: Episode 3 or Half Life 3 (We’re assuming the game will be under one of these two names.) It’s been over 4 years since the announcement of this game. I’ll explain why I’ve created this article in Part 2. Note: I often will reference games via their “subtitle” only. e.g. Opposing Force is for Half life: Opposing Force. Often when I mention Episodes without a number, I will usually mean both of released games with the Episode titles. WARNING!! THIS ARTICLE WILL SPOIL THE STORY OF THE CURRENTLY RELEASED HALF LIFE GAMES AND PORTAL GAMES. Well, it’s not the longest delay between release and announcement, which is currently held by Duke Nukem Forever, at 14 years. Even Valve’s own Team Fortress 2, holds the Valve record, which was arguably dated 8 years before release. Well, Valve, the makers of the Half Life series, Portal and Team Fortress 2, more or less said that it’s coming soon. They actually mention it during the commentary of Half Life 2: Episode 2, that you’d be able to certain things within Episode 3, such as actually fight a Advisor, which was only seen on a screen in Half Life 2 and then one in it’s “pod” in Episode 1. In Episode 2, you actually see what they can do, but you’re unable to fight them. During the segment, entitled Our Mutual Fiend in Episode 2, Dr Isaac Kleiner talks about an missing Aperture Science ship called the Borealis, which Dr Mossman has found in Episode 1. According to Dr Kleiner, the ship when missing with part of it’s dry dock. Since Portal series is set inside Aperture Science’s Laboratories, we could easily talk about it on ASEMBLE without being “off topic”. 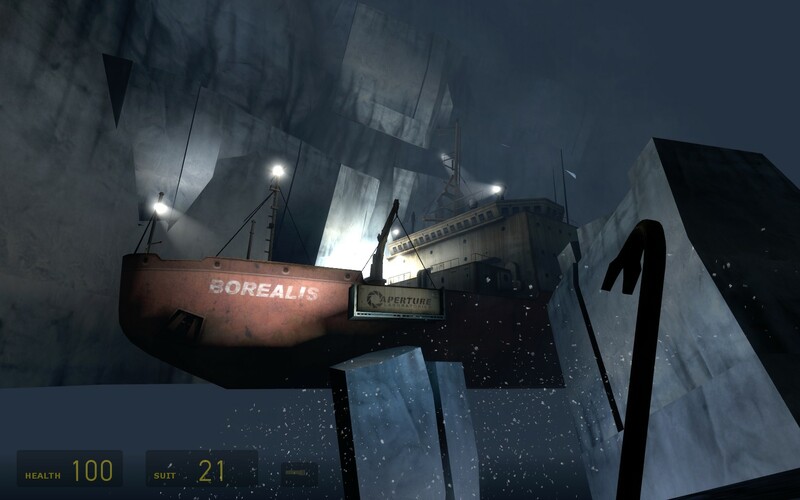 According to Pre-release information, from websites, the out of print book, “Half Life: Raising the Bar” written by Valve staff, and the several leaked versions of the game; before it was cut, the Borealis, or a Ship like it, was going to be part of Half life 2. Several elements that was only used in this section was moved else where, and such as the person who you’d meet on this ship appears in the game. He gives the player the first Rocket Launcher, which the player then must use to beat the “boss” that had just arrived after the player. As Mentioned in Our Mutual Fiend, there is a discussion about the ship. At the same time, the screens behind Dr Kleiner, shows the ship, and some technical sheets. 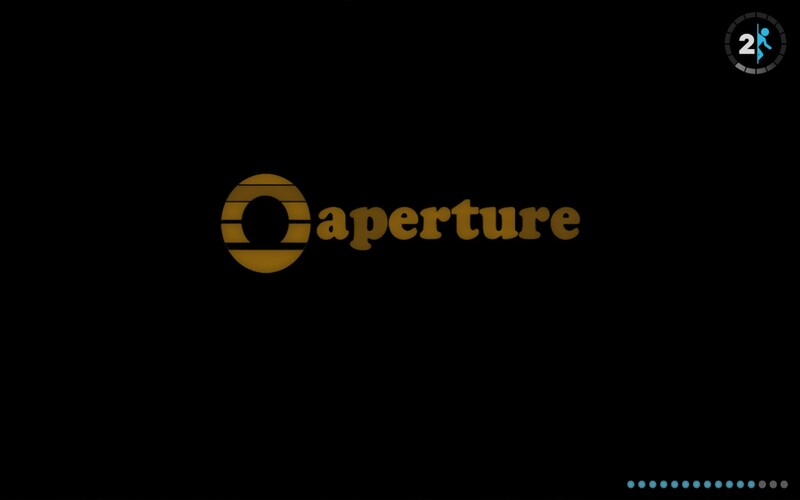 One of the shots you see clearly shows the2000’s version of the Aperture Science Logo is clearly shown. Actually, Due to the way Valve programmed the game, it’s part of the exterior of the ship is actually in the game. Using Cheats, one can actually “Fly” around the ship. Several parts of the Borealis’ Technical Sheets where shown on the screen. With the game editing tools, that Vavle surplies, we can see that the sheets are deliberately cropped so we only see parts of it, however, it shows the 2000 version of the logo and GLaDOS’s name on one of the images. They match another ship, a US Navy cruiser USS Newport News, which was scrapped several years ago. Also included within the files, a “photo” of two known Black Mesa Employees by the ship, presumably taken prior to it’s disappearance. This ship is looks like Icebreaker ship model and the real life ships. 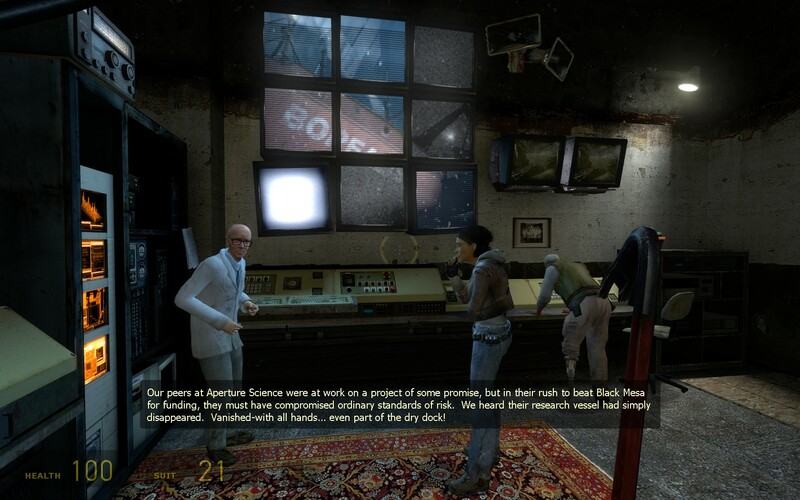 An photo in Half Life 2, shows the player character Gordon Freeman and Dr Kliener with several Black Mesa Employees worked at Black Mesa in the original 1998 Half Life. The team photo is next to the screens showing the Borealis in Episode 2. The two scientists from the Borealis Photo are in the Group Photo, but are not present in the Half Life. Portal was released on the same day as Episode 2. In addition to the single scene and there where few Black Mesa references in Portal connecting the Half Life Series and the Portal “series” at the time. 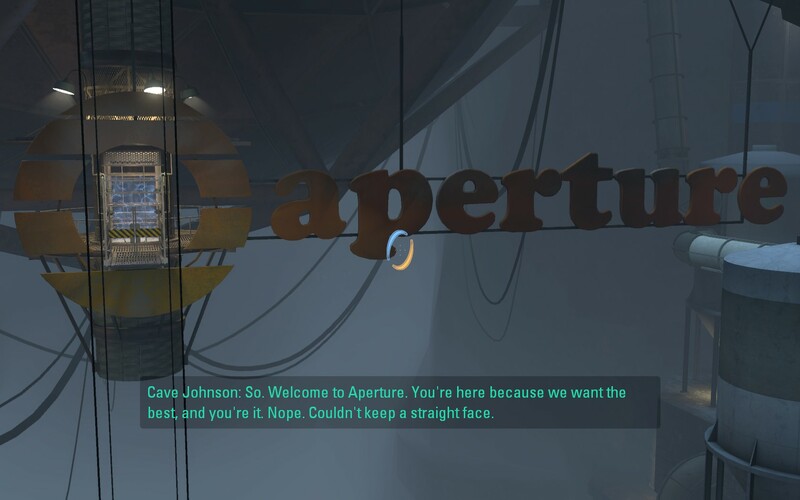 In Portal, Black Mesa was “said” to be a more successful rival to Aperture Science. The Black Mesa logo appears part of a scripted sequence, on GLaDOS’s Screens. Portal 2 doesn’t mention the ship Borealis until you, as Chell, start travelling tough some “preserved” parts of Aperture Science. During the 70’s section you find the Dry Dock with some Borealis Life rings. (You even obtain an Achievement for finding the dry dock.) The way the level was constructed, the dry dock itself was only intended to be viewed from a single view point. How do I know this? Using the same cheat as viewing the Borealis in Episode 2, one can fly around the map. You may spot a Dock crane in the distance, by flying up to it you see there is no floor for the crane to sit on. You wouldn’t be able to see the floor normally, your only view point at the bottom of the dry dock. 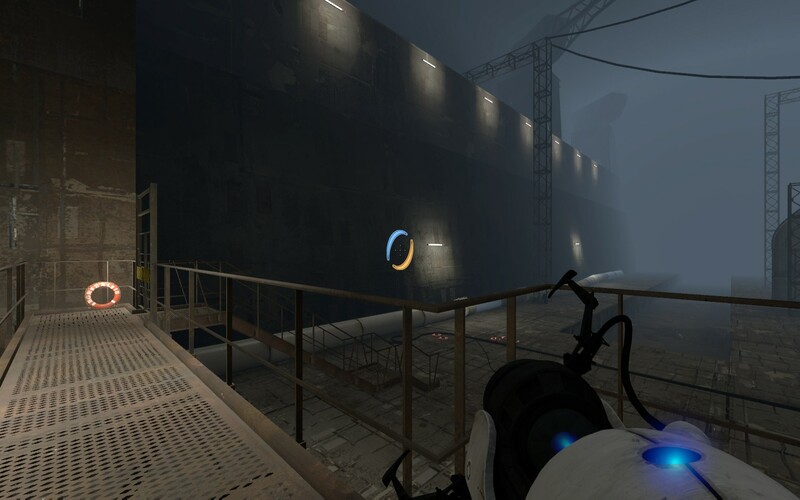 Besides the empty dry dock with Life rings, there is no other reference to the ship is made in Portal 2. Just before you find the ship, a tape recording of the then-CEO of Aperture Science, mentions Black Mesa, further connect the series. In Half Life, you do travel down some abandoned sections of Black Mesa to avoid most of the fighting, so the history of being around several years matches up to what we already know. Portal 2 actually creates some issues. During the preserved section where the dry dock is, the Aperture Science logo is different, and we think area was abandoned during the 70’s given the state of offices and technology in them. The first appearance of the 2000 Logo was in the Section we think abandoned in the late 80s. The other issue is that GLaDOS in the form to sign forms has been stated to be “active” around the late 90s. The forms couldn’t have been signed by her at the time. Also the known Black Mesa Employees are not met in any game, but are seen in a Photo in Half Life 2 and Episode 2. This Photo has the player character, Gordon Freeman and most of the known Black Mesa staff in that section, most of whom appear in Half Life 1, and several are fully developed characters in Half Life 2. Almost all references to dates relate to the “Black Mesa Incident”, which is the events of Half Life. The Official Half Life 1 based games, Blue Shift and Decay are start around the within minutes the start of Half Life. Opposing Force starts a little later due but follows events for later in Half Life. You play different characters, and in three of the games you can see the Playable characters from the other games. Half Life 2 and the Half Life 2 Episodes are set 20 years after the event. However a calendar is never shown and we’re working from Dialogue which loose at best, and the physical age. This would fit given the approximate age of Alyx Vance, and mentioned by her father, Eli Vance when you look at certain picture in Half Life 2. The Picture is of a younger Eli, with a woman, and a young girl, and he said it’s the only other thing besides Alyx, he got out of Black Mesa. The Half Life 2 Episodes set hours to days since the previous instalment. Your character, Gordon Freeman is knocked out at the end of Half Life 2, and at the end of both published Episodes. You start in the wreckage of the thing you where in when something explodes. Portal and Portal 2 offer little dating evidence in game. The only reference to the outside world is in Portal. A line of dialogue suggests happened after the “Black Mesa Incident,” as GLaDOS mentions outside world has changed, and she doesn’t know what’s going on. However, GLaDOS is not entirely reliable as GLaDOS is known for not telling the truth. For the Portal Series, the biggest source for dating comes from the Web Comic Lab Rat. The Story follows Doug Rattmann, who “helps” the player character, Chell, by his art, in Portal and early Portal 2, you visit some of his dens through both games. This doesn’t contradict GLaDOS’s comments, but only places Portal 1 within weeks to at most a few years after the “Black Mesa Incident”. This is assumed mainly as the events in Portal and the comic forces Rattmann to save Chell by manually activating her in her “Hotel room” Stasis chamber with no means of inputting a wake up date. This also provides a reason for the “99999….” Days count at the beginning of Portal 2. The clock wasn’t activated and the Announcer programme just glitches and repeated 9s until it’s turned off. Portal 2 appears to take place several years after Portal, the amount of time is unknown, but we assume it’s quite possible that it’s about 20 years. Some others think 50 or more years may have passed. Why base the timeline around an event, not an actual date? That because the creators have been very “loose” with the actual date of the most events. It also allows them a some of flexibility with in the time line. It avoids creating more contradictions within the series. Since all the games uses the player’s (or players) location to trigger events, the time line of the actual “Black Mesa incident” changes with each play though. One another possible contradiction that can be experienced by the player as Gordon Freeman: In Half Life, you will encounter Black Scientist asks Gordon to get help. It is possible that he gets killed soon after he opens a door for you. (While not advisable, you can kill him.) He is the only black scientist who actually asks to go and get “help from the surface.” In Half Life 2, Eli Vance, a black man who looks like the aged version black Scientist, jokes about the length of time for Gordon to return from the first part of the Black Mesa incident. In the same scene, you can find a photo of him (and his family) which looks like the Black scientist, as the photo was taken before the Black Mesa Incident. A questionable dating reference for the “Black Mesa Indecent,” is provided the “Blue Marble” Calendar. It provides a possible year of in 2003 or 2008. The day has been more or less confirmed as May 16 by one of the Half Life Manuals, and with the 2003/2008 dates placing it on a Friday. Since “Blue Marble” the Calendar is for December, and not very done as one expects, we can assume the Calendar to be “set dressing,” and not to be taken seriously. 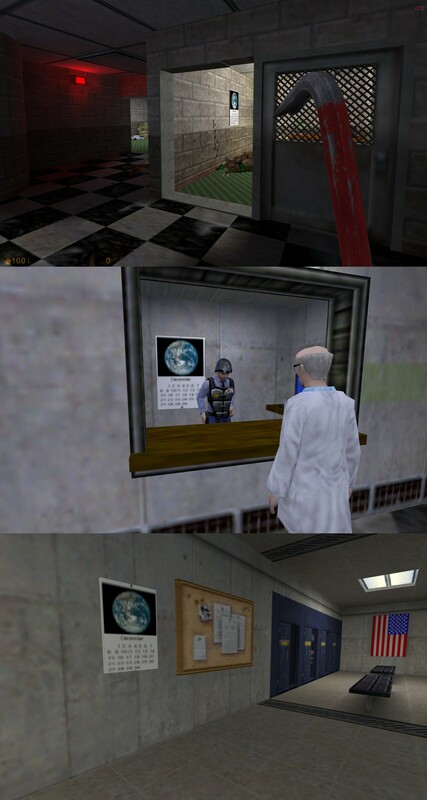 In Half Life, the “Blue Marble” calender only appears in one small office, which is locked and has no occupants when you visit. This provides a logical reason for having an out of date calendar, it’s possible that no one has been in that room since December. An Vortigaunt will appear in this room and in the fight the window will be smashed to allow access to the room. The calendar is also later used in the three Half Life side stories, Opposing Force, Blue Shift, and Decay. As all three were developed out of house, by another company called Gearbox Software, quite often they used existing materials where they can and subsequently use the calendar as a prop item, in Populated areas. In Blue Shift, it appears quite prominently behind a fellow Security Guard, and in the changing room. Currently, we assume the Black Mesa incident happened between 2000 and 2009 due to the Valve interviews, and the letter in the PS2 Manual, which suggests the date of May 16th. This also seems to reflect almost all the known real world technology in use during all game. How did a ship get from a Cave to being buried to a Glacier? Now that I’ve covered what I know about the time line, and what the fans know based on game data. We’ve got a few issues, the biggest is How did a ship that went missing in the Mid 1970s reappear with an 1980s or later company logo on it? The big question I won’t answer is: What on the ship? Well, the Logo is actually on a large container sized crate being hoisted by the ships crane. So the ship can been around in the 70s. Since the Borealis’ dry dock is nearly 4 kilometres underground in upper Michigan, and Aperture has demonstrated that they have working “Teleportation” Technology since the 50s. We can assume that this how they got the ship in and out. It also explains how the ship is in the glacier in the first place. As for the Missing Ship, since the player, at the moment, can only visit up to three mine shaft at least 9 known “Test Shafts.” There could be another dry dock in another shaft, they used that dry dock in before it really disappeared. The count of 9 test shafts is shown via the sign that the player, as Chell, when she visits Test Shaft 9. Later, as the “Co-op” Robots ATLAS and P-Body visit two unnamed shafts, which leaves 6 or more unexplored shafts. It’s also worth noting all three shafts where partially explored. Another theory is that an “Teleportation Accident” could easily send the ship in to “the future.” This happens with Gordon Freeman and Alyx Vance in Half Life 2, when they spend a week in stuck in stasis. This could lead them to Aperture to lock the Door to prevent anyone getting killed if or when the ship returned to the dock. If this was the case, the ship was found. Given False Documents or Refit done, then had it’s Photo taken, before getting lost in the few Months before the “Black Mesa Incident,” but all since GLaDOS operated Aperture Science. In one tape recording, Cave Johnson mentions that a test may contain Time Travel, and not to interact with your other self. 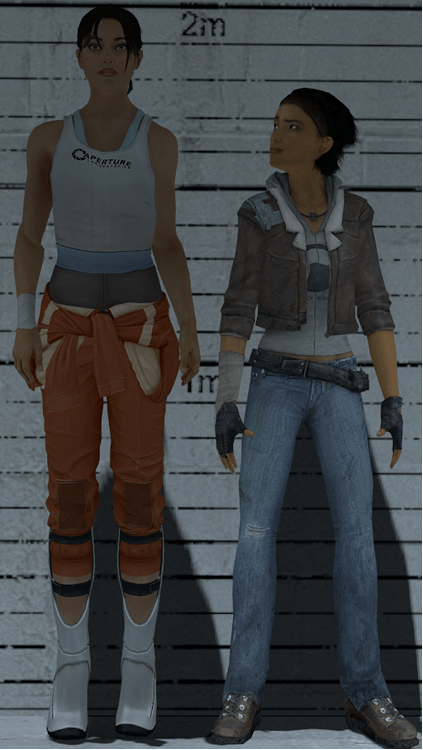 If Time Travel such as going back in time, such as going back in time could also be a viable reason, and could give really good chance for Chell to appear in Episode 3. Normally, for articles for this site, I aim for an 2500 word count. However I just broke that limit in the previous Paragraph. I’ve got way enough material to cover at least another 2500 word article. Most of the Information had been initially found out by the members of http://combineoverwiki.net I must thank Valve Software and Gearbox Software for making the games and proving hours of entertainment. I must also thank Valve Software and their fans for providing the tools to look at this data and the ability to the screen shots in game. The “cheats” I’ve mention do not require altering files, but as they affect game play they disable things like Achievements. Valve has a list of the “cheats” with their effects are available on their website.